Last year Birchbox created their first-ever New York Fashion Week press lounge, the Birchbox Sample Stop. This year, they're at it again with Birchbox Local, open to the public from September 12th - 16th. Customers can book makeup, hair and nail services, purchase and build their own Birchbox at the sample wall, and buy full-sized product from prestige brands such as Color Club, Stila, Oribe, Caudalie and Jouer. 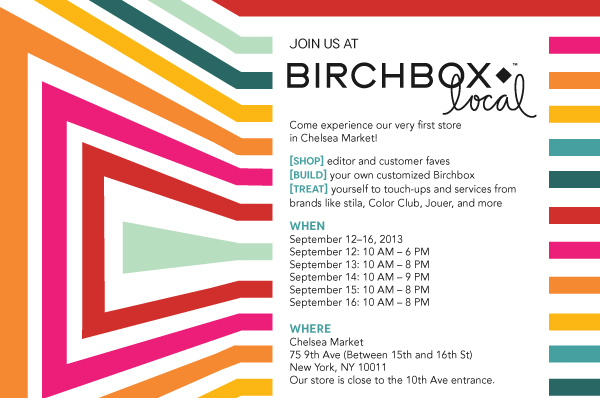 Birchbox Local has expanded to two floors within Chelsea Market, located directly across the street from MILK Studios. Reservations will be secured for $15, and include a $15 voucher that is redeemable towards a 'Build Your Own Birchbox' or full-size retail products (in-store only).